The first thing you'll notice about the SteelSeries Apex 300 UK Keyboard is that this popular apex keyboard is incredibly fast thanks to the lowered profile of the keys. Also, with its SteelSeries Engine 3 Configuration suite (including macros custom profiles) you can access customized profiles and lighting options with the Steel Series Apex 300 UK Keyboard. For instance, with extra brilliant white illumination you can turn off all of the lights in your gaming room for more inspiring ambiance. Simply put it, the apex 300 delivers the essential features that serious gamers need to give them that crucial competitive edge: this keyboard supports anti-ghosting for twenty keys in the area of the keyboard that gamers use the most. There are also raised indentations on the W key making it easy to find your way back to the WASD region of the keyboard. 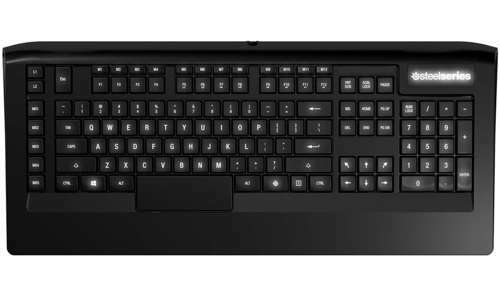 In addition the angle of the SteelSeries Apex 300 keyboard can be adjusted between 7 and 10 degrees. Thanks to the swappable feet, you will find the perfect angle of attack for hours of uninterrupted gameplay.